D.C.'s parks are overrun with invasive plants. But one local artist is doing his best to help get rid of the unwanted vegetation. WASHINGTON — When Patterson Clark walks through the city’s national parks, he sees more than leaves, branches and berries. To him, it’s all art. Clark, a D.C. resident and graphics editor at The Washington Post, spends about 40 hours a year volunteering with the U.S. National Park Service to remove invasive plants from D.C.’s forests. “Local plants and animals depend on native vegetation for food and shelter, so they’re not adapted to this exotic, invasive vegetation,” he says. Sometimes he leaves the ivy, stems and shoots he cuts down with his hand tools on the ground to decay. But more often than not, Clark takes the materials back to his Northwest home and fashions them into art and art supplies in his basement studio. White mulberry, Clark explains, was introduced in the U.S. in the early 1800s as a food source for silk worms. The silk industry didn’t take off, but the trees did — and now they’re everywhere. Only Clark doesn’t see them as a nuisance. “This tree makes the best paper,” he says. He cuts the stem, steams it, scrapes off the bark, cooks it down in washing soda, beats it, suspends it in water and molds it into paper. “And you’ve got a nice strong sheet,” he says. The Asiatic dayflower is his go-to source of blue ink (he grinds the petals in a mortar and pestle with water), and the multiflora rose makes a great paint. He also derives an aqua ink from the inner bark of a bush honeysuckle and a golden paper from the Japanese honeysuckle. “There’s this abundance of material out here that nobody wants. In fact, they want it gone,” Clark says. Clark has been transforming D.C.’s unwanted weeds into pigments and prints for about 12 years. The former biology major and art scholar says over the years, it’s turned into more of a second profession than a pastime. Each piece Clark creates takes days, weeks and months to come together. For example, when it comes to making paper, he estimates it takes 20 minutes to cut down the plant, 30 minutes to steam it, 5 minutes to strip the bark, 3 hours to scrape it, an hour to cook it, 20 minutes to wash it and an hour to beat it. 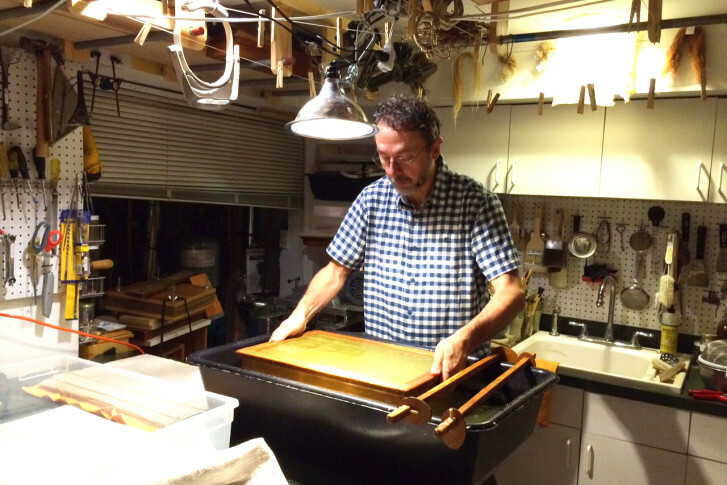 Then, he molds the sheets and dries them overnight — and that’s just to yield five sheets. Then it’s on to the paints and designs. “This practice is more of a gesture to show what can be done with an unused abundance,” says Clark, who adds that 99 percent of all his art materials come from invasive plants in the local area. For many of his prints, Clark creates a digital design on the computer and laser-cuts it into blocks of wood. (The wood, he says, is not taken from National Parks land.) He then rolls his plant-based ink onto the block and transfers it onto his homemade paper. Even the frames and the mattes that showcase Clark’s prints are handmade from local foraged plants. “So then, if I sell a piece of art, [the time it takes to make the supplies] is worth my while,” he says. “I don’t have a lot of hostility toward these plants; I’m just trying to work with them in a sustainable way. I’m taking these plants out of the landscape, and removing them helps with environmental restoration, and that’s the bottom line,” he says. View Patterson Clark’s art on his website, Alienweeds.